We are thrilled to announce our showcasing artists at APCA National Conference February 21-24 in sunny Orlando, Florida and APCA Spring Northeast Regional Conference March 15-17 in Hershey, Pennsylvania. ·Thursday, February 21st at 5:30 pm Showcase ~ Dez Duron. Fresh off the European tour with Post Modern Jukebox, Dez reached National Prominence on NBC’s hit series The Voice. His old soul crooner style mixed with pop sensibilities gained him a spot in the Top 8 and made him the last man standing on team Christina Aguilera. Friday, February 22nd at 1:30 pm Showcase ~ Edzui “Edge” Szumowski. Physical Comedy Juggler that has multiple television appearances including Late Night with David Letterman and Discovery Channels ‘Time Warp.” He has had three Nationwide tours with the Greatest Show on Earth, The Ringing Brothers Barnum and Bailey Circus and is the world's only juggler to receive a Mechanical Patent on a juggling prop that has existed since Vaudeville (great story!). Original ideas, high energy performances, mind blowing tricks. NOT your parents juggling show! Friday, February 22nd at 6:00 pm Showcase ~ Patrick Roche. Third in the world at the 2016 Individual World Poetry Slam. He is an award-winning poet and performer from New Jersey. Videos of Patrick’s work have amassed over 7.5 million views on YouTube, making him one of the most popular spoken word poets and has been featured on Buzzfeed, The Huffington Post, UpWorthy, MSN, iHeartRadio, and more. Friday, February 22nd at 6:00 pm Showcase ~ Sub-Radio. Washington DC based Indie-Pop Band, Sub-Radio, have opened for such diverse artists as Smallpools, Vinyl Theater, and Aloe Blacc, and others. Their festival appearances include Firefly Music Festival, Capital Pride, Launch Music Conference & Festival, and Celebrate Fairfax, among others. They are currently at work on new music with Producer Dylan Bauld (Smallpools, Maty Noyes, Halsey, Flor) to be released early 2019. Saturday, February 23rd at 1:00 pm Showcase ~ Martin Rafferty. Having already fulfilled a dream of recording in the historic Studio 3 at London’s Abbey Road Studios, his brand-new EP was recorded at Manor Park Studio, Co. Antrim in conjunction with producer Neal Calderwood and EP tracks have already gained serious rotation on 200+ US radio stations, been licensed by 20 major TV networks such as FOX, ESPN, E! Television, Discovery, National Geographic, NASCAR and Spike, and blasted out in big US sports arenas throughout the USA. Saturday, February 23rd at 1:00 pm Showcase ~ Saints of Marfa. The hybrid of Modern Electronic Music/Rock/Hip-Hop band auditioned, competed, and won against 300 acts/bands to play Houston Super Bowl Live event. The had the #1 most requested song on The Texas Buzz 3 weeks in a row. They have performed at SxSW ‘17, Frontier Fiesta ‘18 w/ Jeremih, Whateverfest w/AWOLnation/Cold War Kids and MRFest San Marcos. Saturday, February 23rd at 6:00 pm ~ Alexis Kings. Transcending throughout the Indie, Pop, Rock, and Alternative genres, this is authentic feel-good music that you'll not soon forget; embracing listeners of all ages, all demographics, and all nationalities. The have been showcasing London’s ever-evolving music scene, Brenden Aherne (Singer) and Sam Privett (Guitarist) from the band “Alexis Kings” (considered “THE band to listen to” by John Kennedy of BBC’s Radio X) have big plans for 2019. 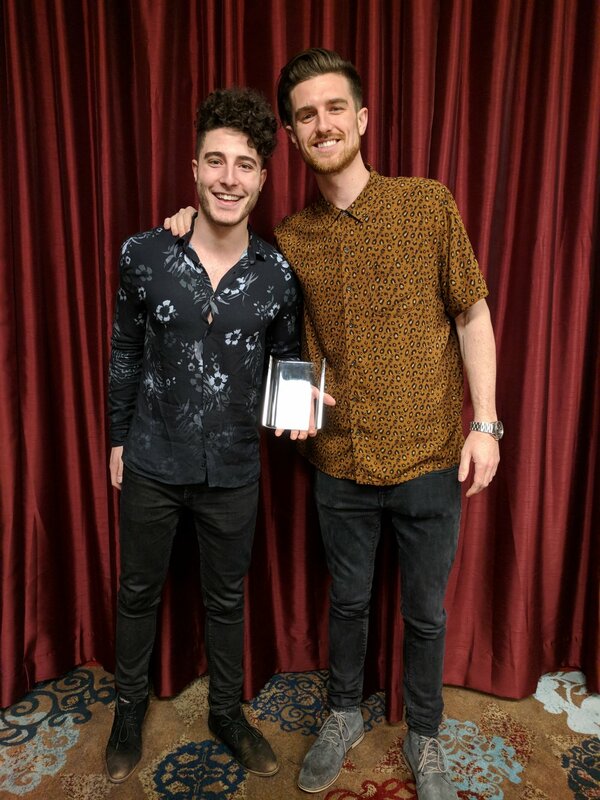 In addition to touring and performing all over the world (including the "Summer Sonic Festival" in Shanghai, China) this duo is adding US college dates alongside their UK university success. Friday, March 15th at 11:30 am Showcase ~ Dez Duron. Fresh off the European tour with Post Modern Jukebox, Dez reached National Prominence on NBC’s hit series The Voice. His old soul crooner style mixed with pop sensibilities gained him a spot in the Top 8 and made him the last man standing on team Christina Aguilera. 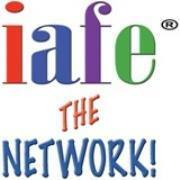 Friday, March 15th at 3:00 pm Purposeful Programming Showcase ~ Isak Allen. Regular at the World-Famous Comedy Store in Hollywood and seen on HBO’s Westworld. He is a writer for the web series “LOL Parenting” as well as seen on the web series “LOL Parenting” and “Anime Crimes Division.” He has shared the stage with the likes of Bill Burr, Joe Rogan, Tom Papa, Joey Diaz, and many more. Friday, March 15th at 3:00 pm Purposeful Programming Showcase ~ Soul Steps. 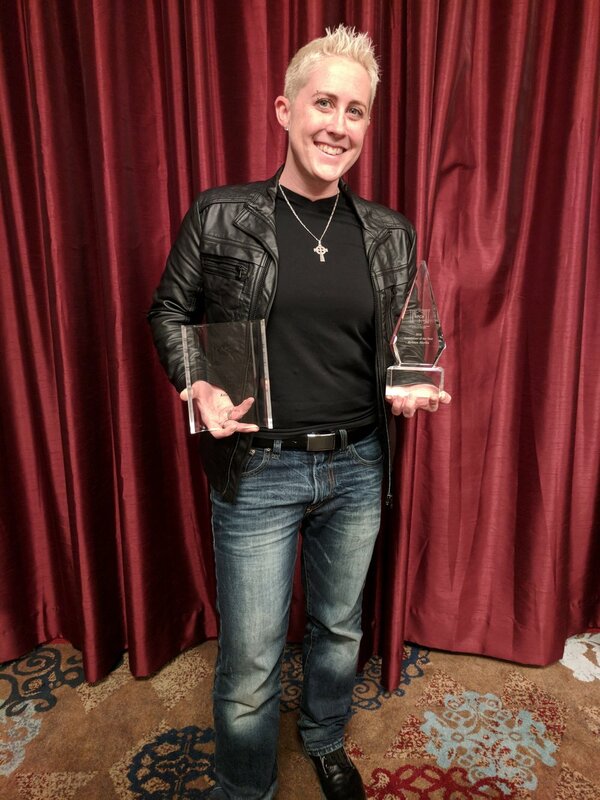 Named APCA 2018 Diversity Act of the Year and 2010 Cultural Artist of the Year. They have shot a promo video for mtvU, been featured in the Diesel Jeans viral sensation, “A-Z of Dance” with over 3.1 million views, made a cameo appearance in the indie rock band music video, “Man on Fire” by Edward Sharpe and the Magnetic Zeroes, and opened for esteemed artists such as Alvin Ailey and reggae legend Freddie McGregor. Friday, March 15th at 5:30 pm Showcase ~ Dave G. Dave G is a Philadelphia-based spoken word poet, performer and entertainer and a 2017 Penn State University - University Park graduated. He competed at the 2015 Penn State IFC/Panhellenic Dance Marathon (THON) with an audience of 40,000+ and won over the crowd with his poetic wordplay, charismatic delivery and shameless transparency. He organized and performed at poetry shows that attracted hundreds of students. He also assembled and earned a spot on Penn State’s first nationally competing slam poetry team, which succeeded 68 collegiate teams to a co-championship at the 2017 College Unions Poetry Slam Invitational (CUPSI) in Chicago. Saturday, March 16th at 12:00 pm Showcase ~ Sub-Radio. Washington DC based Indie-Pop Band, Sub-Radio, have opened for such diverse artists as Smallpools, Vinyl Theater, and Aloe Blacc, and others. Their festival appearances include Firefly Music Festival, Capital Pride, Launch Music Conference & Festival, and Celebrate Fairfax, among others. They are currently at work on new music with Producer Dylan Bauld (Smallpools, Maty Noyes, Halsey, Flor) to be released early 2019. Saturday, March 16th at 3:30 pm Purposeful Programming Showcase ~ Patrick Roche. Third in the world at the 2016 Individual World Poetry Slam. He is an award-winning poet and performer from New Jersey. Videos of Patrick’s work have amassed over 7.5 million views on YouTube, making him one of the most popular spoken word poets and has been featured on Buzzfeed, The Huffington Post, UpWorthy, MSN, iHeartRadio, and more. Saturday, March 16th at 6:00 pm Showcase ~ Shenna. Pop/R&B New York City based artist who has been featured in Billboard, MTV, VH1, AXS, and Oxygen. With nearly One Million streams on all music platforms, Shenna has performed throughout North America and Europe at places such as London's 'The Half Moon', LA's 'The Mint', Disney World, The Highline Ballroom and Festivals like DC Pride, Holi Hai, and Washington's Cherry Blossom Festival. Shenna recently partnered up with Reebok's flagship store for a holiday toy drive and live performance. Posted on January 24, 2019 by Lee Mayer. 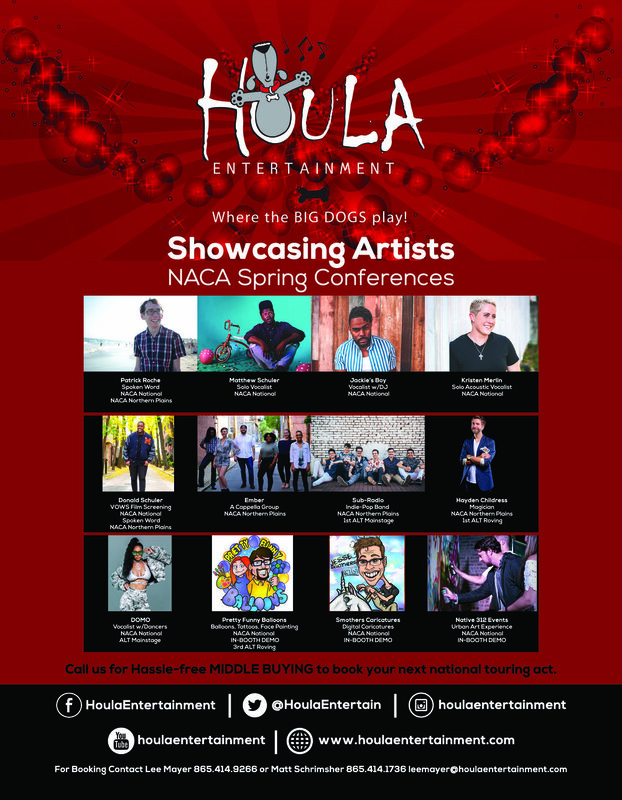 We are excited to announce Houla artists that will be showcasing this Spring at NACA National Convention February 16-20 in Columbus, Ohio and NACA Northern Plains Regional Conference March 28-31 in St. Paul, Minnesota. Stop by the Houla booths for many in-booth showcases in Columbus. Native 312 Events will have an artist guided, hands-on program that invites you to explore the world of Urban Art. Are you ready to paint outside of the lines? World Record Holder Balloon Artist Brian Getz and Christina Getz with Pretty Funny Balloons will be applying glitter tattoos, face painting and making amazing balloons. They are also a Roving Alternate. Smothers Caricatures will be hand drawing, high definition digital caricatures with a new and exciting twist on traditional art form. Jesse has drawn over 10,000 people. Saturday, February 16th at 5:55 pm Showcase #1 ~ Patrick Roche. Third in the world at the 2016 Individual World Poetry Slam. He has over 7.5 million views on YouTube and has been featured on Buzzfeed, The Huffington Post, UpWorthy, MSN, iHeartRadio, and more. Monday, February 18th at 10:00 am ~ VOWS Film Screening with Donald Schuler. This award winning inspirational short film focuses on a struggling man who seemingly has the weight of the world on his shoulders. After coming to the realization that he needs some sort of outlet, he discovers something that could help him get back on track. Monday, February 18th at 10:00 pm Showcase #4 ~ Matthew Schuler. Finalist on Season 5 of "The Voice" with the Fastest 4 chair turn around in "The Voice" history. His rendition of "Hallelujah" reached #1 on the iTunes charts. He has shared the stage with Diana Ross, Shaggy, Ne-Yo, Sean Paul, Christina Aguilera, DNCE, and Flo Rida. Tuesday, February 19th at 2:55 pm Showcase #5 ~ Jackie’s Boy. Grammy Award Winning and 4-Time Grammy Nominated Songwriter, iHeart Digital Artist of the Month and ASCAP Rhythm & Blues Songwriter Winner 2018. Tuesday, February 19th at 8:30 pm Showcase #6 ~ Kristen Merlin. Semi-Finalist on NBC’s The Voice - Season 6 where she consistently topped the iTunes Country charts with her tracks from “The Voice.” She was named APCA 2018 Entertainer of the Year as well as 2018 and 2015 Female Solo Artist of the Year. She has shared the stage with Kellie Pickler, Sugarland, Bryan White, Shakira and more! DOMO was a Contestant on "The Voice" and MTV's "America's Best Dance Crew." She has shared the stage with artists such as Missy Elliot, RedFoo (LMFAO), Busta Rhymes, Usher, Rick Ross, Sean Kingston, and many more. She has headlined her own tour in Asia and the UK. DOMO is a Mainstage Alternate. Thursday, March 28th at 6:49 pm Showcase #1 ~ Patrick Roche. Third in the world at the 2016 Individual World Poetry Slam. He has over 7.5 million views on YouTube and has been featured on Buzzfeed, The Huffington Post, UpWorthy, MSN, iHeartRadio, and more. Friday, March 29th at 2:55 pm Showcase #2 ~ Ember A Cappella Group. Their beatboxer, Michael, was a Semi-finalist in the American Beatbox Championships in 2018. Members have been nominated for 15 Contemporary A Cappella Recording Awards (CARAs), including 4 wins. Also nominated for three A Cappella Video Awards (AVAs), including one win. Saturday, March 30th at 8:05 pm Showcase #6 ~ Donald Schuler. Selected as one of Philadelphia's 2017 Artist to watch by CBS Studios and Sony Red Entertainment over 200,000 streams/votes. Donald is an Award-winning Screenwriter and has worked with Tranzformaz Music Group/Universal Music group, Multi-platinum recording artist Shaggy, ‪Christina Aguilera, Mike Posner, his brother ‪Matthew Schuler (The Voice Season 5) and many other artist and industry professionals. Washington DC based Indie-Pop Band, Sub-Radio, is the 1st Alternate Mainstage. They have opened for such diverse artists as Smallpools, Vinyl Theater, and Aloe Blacc, and others. Their festival appearances include Firefly Music Festival, Capital Pride, Launch Music Conference & Festival, and Celebrate Fairfax, among others. They are currently at work on new music with Producer Dylan Bauld (Smallpools, Maty Noyes, Halsey, Flor) to be released early 2019. Magician Hayden Childress is the 1st Alternate Roving. Hayden has performed over 65 shows in 2016 while working towards a double major in college (he just graduated in 2017). He has sold out shows in performing arts centers in the Southeast and has won awards from reputable magic organizations such as the Society of American Magicians for his upbeat, fast paced, and unpredictable sleight of hand magic and comedy. He has been featured on Charlotte television and media. Posted on January 23, 2019 by Lee Mayer. We are thrilled to have another impressive list of talented showcasing artists at the APCA Fall Conferences. 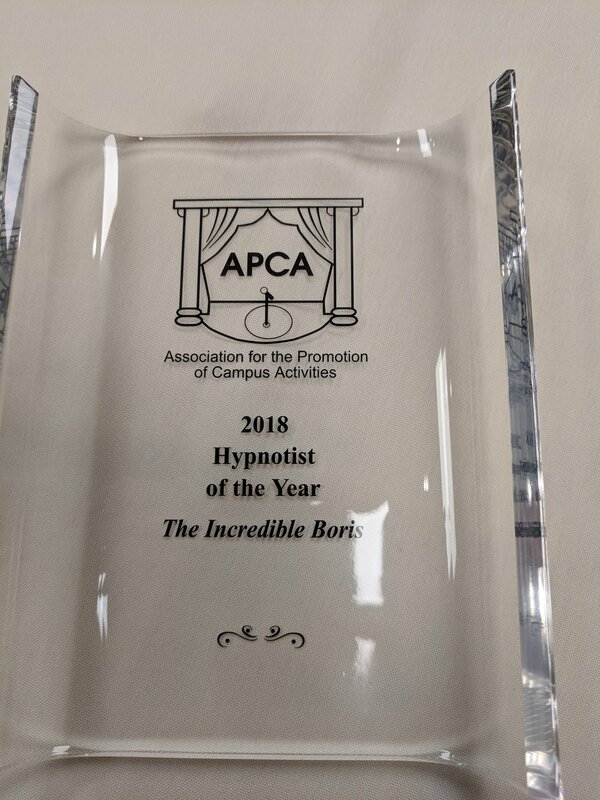 We will be in Houston, Texas at APCA South Central; Teaneck, New Jersey at APCA Northeast; and Chicago, Illinois at APCA Midwest showcasing many award-winning artists including Comedians, Spoken Word, Magic, Hypnotist, Step Dancing, Caricature Artist, and Music. Featuring APCA 2018 Cultural Act of the Year - Soul Steps, 2018 Hypnotist of the Year - Incredible Boris, and 2018 Female Solo Artist of Year and Entertainer of the Year - Kristen Merlin and many other very talented artists. Make sure you stop by the booth at APCA Northeast, Jesse Smothers will be drawing your caricature at the in-booth showcase. Check out www.houlaentertainment.com to watch videos of each of our showcasing acts and other talented acts. 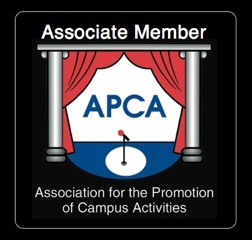 Posted on October 8, 2018 by Lee Mayer and tagged apca APCA2018. We are excited to announce our amazing talent that will be showcasing this Fall at NACA Regional Conferences - NACA South in Atlanta, Georgia; NACA Mid Atlantic in Buffalo, New York; NACA Mid America in Grand Rapids, Michigan; NACA Northeast in Hartford, Connecticut; and NACA West in Ontario, California. Stop by the Houla booths for many in-booth showcases. For amazing close-up magic Hayden Childress will be at Northeast and West conferences. World Record Holder Balloon Artist Brian Getz and Christina Getz with Pretty Funny Balloons will be applying glitter tattoos, face painting and making amazing balloons at West and Jesse Smothers will be drawing your caricature at Northeast. We have returning and new artists showcasing at all the NACA conferences that will WOW you! Posted on October 6, 2018 by Lee Mayer. We are excited to have an amazing line-up of showcasing artists at the NACA SOUTH Regional Conference in Atlanta September 27-30. Stop by the Houla booth 309 to get your caricature drawn by Jesse Smothers on Friday and Saturday. Ask us about middle buying for your next concert. No concert is too big or too small for Houla! Posted on September 20, 2018 by Lee Mayer. We are so excited to welcome Candice Strong to Houla Entertainment. Candice will be interning with us through the summer. Candice is a senior at Converse College working towards a degree in Psychology and certificate in Music Business. She grew up in Andrews, South Carolina. She is the vice chair of the Converse Activities Board along with being involved with several other organizations on campus. She is passionate about leading others and going above and beyond to get a job done. She hopes to have a career in the Music Business. Please welcome Candice to the Houla family. Candice's email is candices@houlaentertainment.com should you need to reach her. Posted on June 3, 2018 by Lee Mayer. 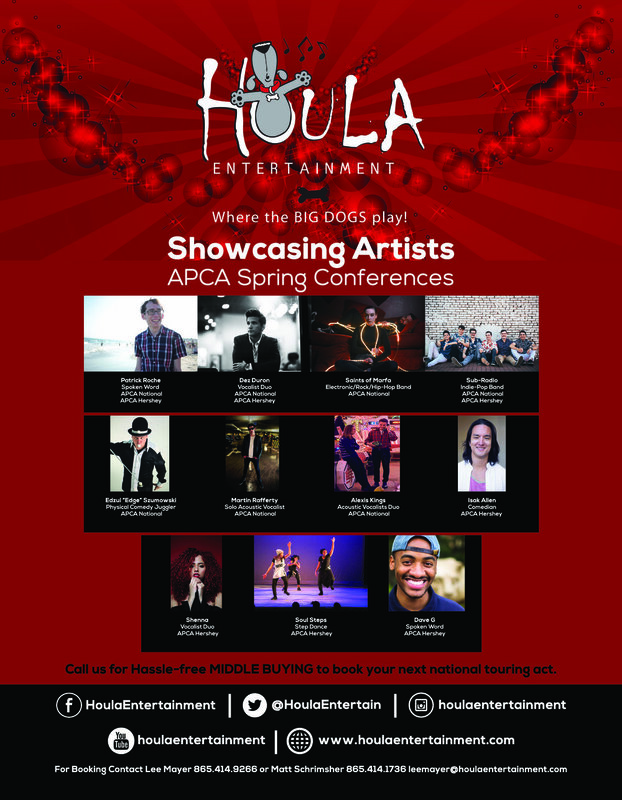 Five awards were given to Houla Entertainment artists at the February 2018 APCA National Conference in Orlando, Florida. "We are so honored to have such amazing artists in the Houla family" Lee Mayer said after the awards. We are thrilled to have an impressive list of talented showcasing artists at the APCA Spring Conferences. We’ll be in Orlando, Florida on February 22-25 at APCA National Conference followed by APCA Northeast Spring Conference on March 16-18 in Hershey, Pennsylvania. As always, we will have fantastic comedy, magic, hypnotism, music and lots of fun for everyone. And, to blow your mind, Haydini will be reading minds in the Houla booths at APCA National. Check out www.houlaentertainment.com to watch videos of each of our showcasing acts. Posted on February 6, 2018 by Lee Mayer. We are excited to announce our amazing talent that will be showcasing on February 16-21 at NACA National in Boston, Massachusetts, March 9 and 10 at NACA Mid Atlantic Festival in Shippensburg, Pennsylvania, and at NACA Northern Plains in St. Paul, Minnesota on April 5-8. Stop by the Houla booths and see amazing close-up magic and get your mind read by Haydini in Boston and Shippensburg. World Record Holder Brian Getz will be in Boston and St. Paul making balloons and we are excited for you to try to stump him with your balloon requests. Posted on February 5, 2018 by Lee Mayer. Bad news is never easy to accept, and it's even more difficult to communicate in any form. However, we learned today that Houla Entertainment artist, Tay Watts, was pronounced missing late Sunday evening after falling off the Crystal Pier in San Diego. The Coast Guard and Search/Rescue teams had been searching since, until this afternoon when they called off the search without successfully locating Tay. For any of you that have had the pleasure of meeting Tay and listen to the passion and love he poured out through his music, you know what a truly nice and talented young man he was....he will be missed by so many. We are obviously stunned in having to come to terms with this heartbreaking news, for Tay became one of Houla's "family" members shortly after he emailed me in the summer of 2016. As many of you know, our artists become family and this makes any loss especially hard for me and all of the Houla family. Please, in your own way, say a prayer for Tay, for his family, and all of us at Houla as well that they somehow find peace through this difficult time. Posted on January 23, 2018 by Lee Mayer and tagged TayWatts.